I hope you are all well ! With it being the New Year and everyone talking about what their resolutions are going to be for the next year. I do not feel the need to jump on that band wagon, in fact the opposite. I do not do resolutions for the New Year simply because I am horrible and keeping them and know this. However I do want to take the next little while and really focus on me and what I want and what makes me happy. 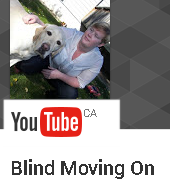 I started this blog to help educate people about blindness and to have people see me for more than my disability. I am in awe of the support I have received from complete strangers, and the messages saying how I have helped them. I am so happy to have had the opportunities that I have had over the last year because of the hard work that I have put in, it really did pay off. So to do this I will be doing posts on the things that I love and the things that happen in my life. I am much more than a person living with blindness. I want to share those things with everyone to show them that blindness does not define our lives. There are so many things that I do in my daily life that have nothing to do with blindness. There are also many things about me that I have not shared like the fact that I was a teen mom. I had my daughter at the age of 18 and had to grow up very quickly. After I had my daughter I got married at 20 and then had two more children. I have been very focused on being a mother, and wife. I was determined to not be a statistic when it came to being a teen mom and now that I am 32 I feel like it is time to focus on me, really take the time and spend it doing things that bring me absolute joy! So I hope you are all happy to come along on the journey of discovery over the next little while. I have lots of post ideas and am glad to have you along for the ride of my life!